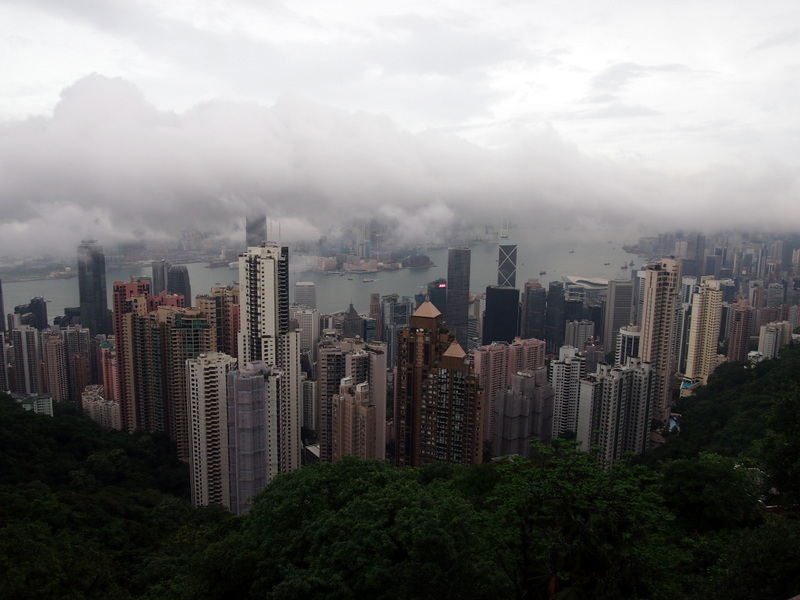 A 48 Hour Hong Kong Experience: The Fun Begins! 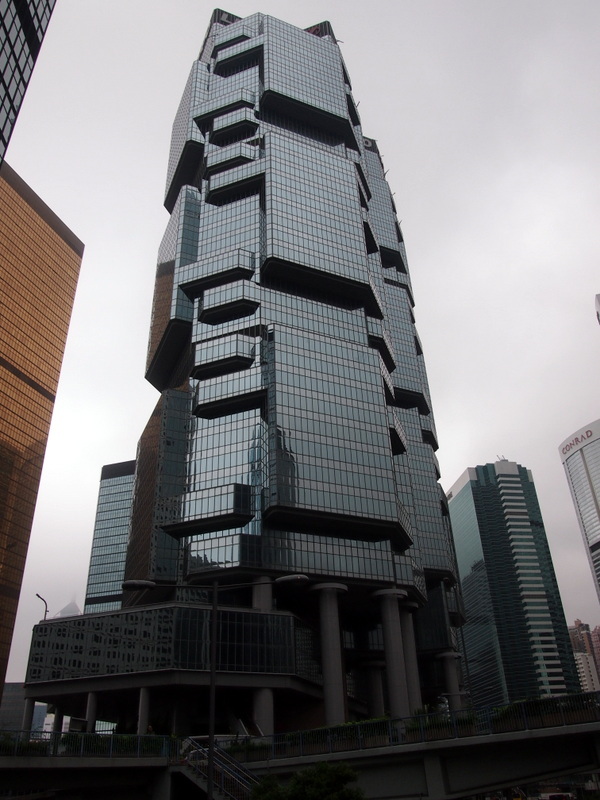 Ana sayfa Asya Hong Kong A 48 Hour Hong Kong Experience: The Fun Begins! So there I was – all signed up for the Big Bus Two Day Deluxe Tour and ready to enjoy my Hong Kong Experience. As I mentioned in Part One of my Hong Kong story, the Big Bus Sales lady caught me as soon as I left my hotel. 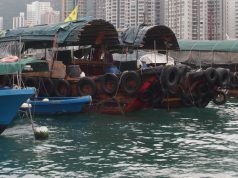 Once she had signed me up and explained all of the tickets and important times, I set off towards the Kowloon Star Ferry terminal. My tour package included 4 one-way Star Ferry tickets, enough for the two days of the tour. This made an easy ferry trip (you can pay for your own ticket at the self-service machines if you don’t hold a pre-paid ticket), even easier. 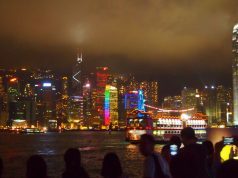 The Ferry journey from Kowloon to Hong Kong Island takes just seven minutes and is a pleasant little taste of the past as the Star Ferries are the original ferry boats kept lovingly in good condition. Once on the other side, the Big Bus Tour pick up point is easy to see, as it is on the road right outside of the ferry terminal exit. The buses themselves are distinctive – they are red two-level buses with an open top deck. Of course the top deck is the most popular place to sit, so there is usually a mad rush to get the best seats whenever a new bus pulls up. Each person is provided with a Big Bus Tour Map, a set of earphones and an optional plastic raincoat. Each seat on the bus has a plug for the earphones and the recorded commentary is timed to match each place of interest. At least 10 languages are provided for – sadly Turkish isn’t one of them, but the main Asian and European languages are all covered. The first stop is the site of the ceremony where the British officially handed back Hong Kong to the Chinese. There is a convention centre and a large statue of Hong Kong’s national flower, the Bauhinia. I stayed on the bus at this stop, as I still had my ‘list’ in my head of things that I wanted to see and the flower wasn’t on this list. The bus then carries on to the eastern side of Hong Kong city, called Wan Chai. This area is famous for food, mid-range/up market shopping. Had I stayed longer, I might have explored this area, as I love shopping, but no, I stayed on the bus and enjoyed the brief view of the shopping area, Hong Kong’s famous tram system, and Victoria Park. At this point an unexpected hiccup occurred in my perfectly planned day. The clouds came down and it began to rain quite heavily. 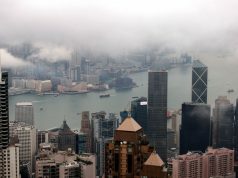 The end of May/beginning of June marks the start of the rainy season in Hong Kong. The free raincoat now made perfect sense! It was still raining as the bus turned inland and back to the west. However, I got off as planned at the entrance to the Peak Tram, even though I could barely see about 30 meters up the mountain. 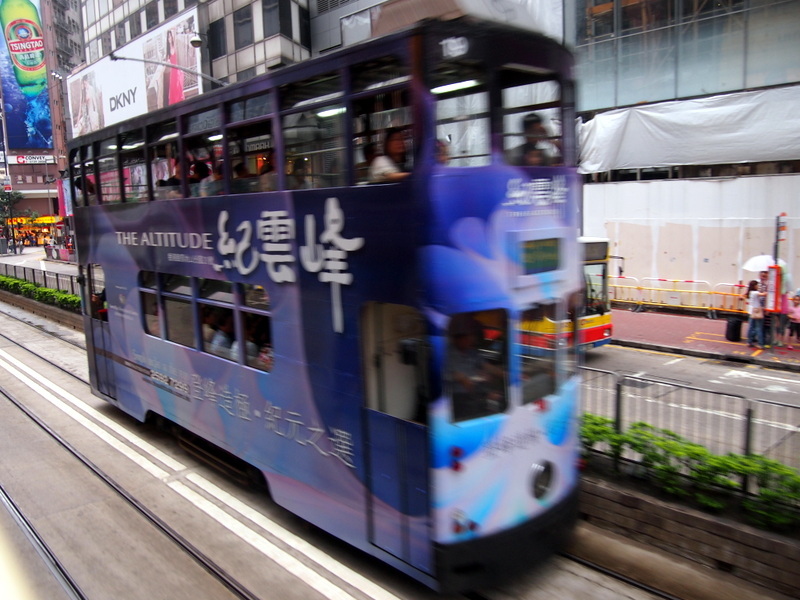 The Peak Tram is Hong Kong’s most famous tram as it goes uphill at a quite steep angle before stopping to let passengers get off in the basement area of ‘The Peak’, the famous building on top of the mountain. The journey takes about 5 minutes and a free return ticket is included in the tour package. I’m sure there is a great view on sunny days…. It was still raining when I arrived at the top. I had a wander through the usual selection of souvenir shops and briefly considered going to Madam Tussaud’s Wax Museum but the memory of how it expensive the London version was put me off. I decided to brave the rain and go to the viewing deck in the hope that the rain might stop. It didn’t, so I went and had lunch instead. This proved to be a good decision: the weather cleared as unexpectedly as it had started and I managed to get some reasonable photos before heading back down the mountain on the tram. My timing was excellent and I only had to wait for five minutes at the pick-up point before the next Big Bus came past. 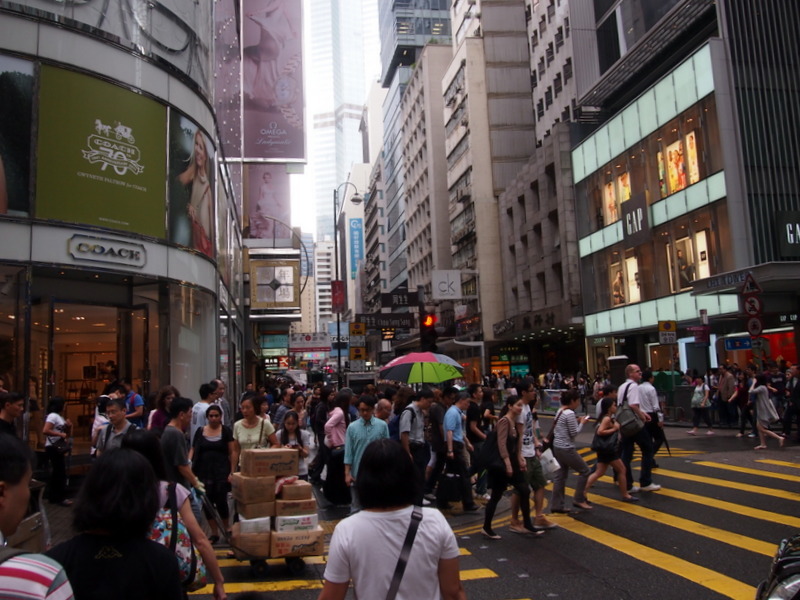 I only stayed on the bus for a few minutes before getting off again – this time on Queen’s Road Central – the most famous road on Hong Kong Island. This area is one of the main business areas, but also has great food, bars and shopping. Here I wanted to simply walk along Queen’s Road, take the famous outdoor escalator and then walk across to Man Po Temple. Hong Kong is a curious mix of East meets West. The influence of the British is everywhere: I’ve already mentioned the double decker buses, which is so ‘London’; but there are British chain stores, loads of British pubs and of course many people speak English fluently as well as speaking Cantonese. Yet it remains also a Chinese city: most of the inhabitants are Chinese, most signs are written in Chinese with English translations and of course the food is unmistakeably Chinese. This really is a great city to get an introduction to China before travelling to the mainland. Queen’s Road definitely has a great atmosphere and I would have liked to spend more time there, but time was something I had to be careful with. 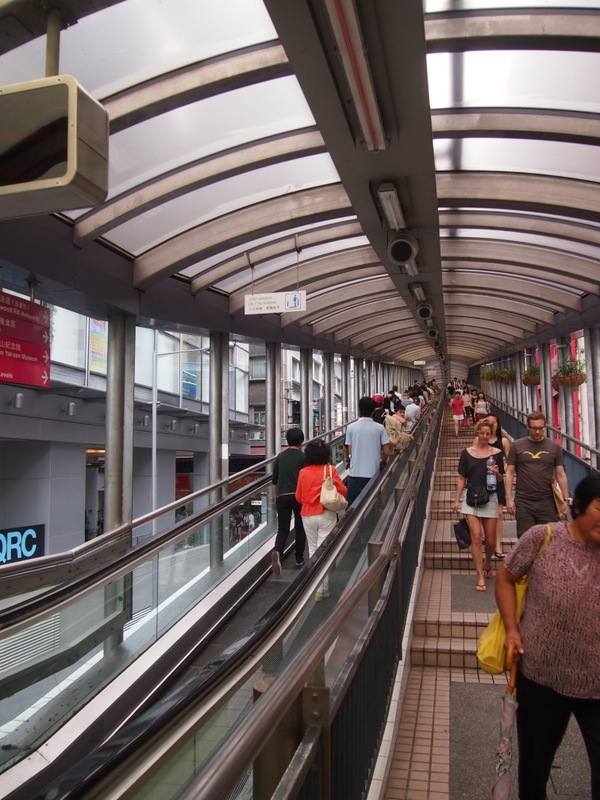 The outdoor escalators were interesting and certainly make it easier to travel to streets further up the mountain. It must have been a difficult walk in the past! Man Po Temple provided a good photography stop, although it is not much to look at from the outside. 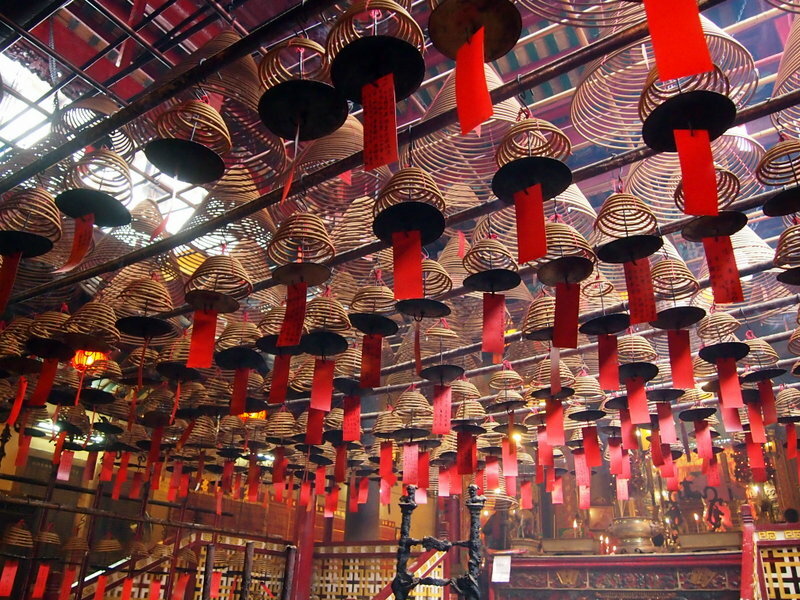 It is the incense coils hanging from the roof that attract the visitors. But be warned, burning ash could drop down onto you at any time! This time around, I had to wait for about 15 minutes for the next bus. Man Po Temple was my last stop on the tour before going back to my start point at 3.30 pm. As part of my package I had a ticket for a one hour day time harbour cruise. There were only two times left: 4.20 and 5.20 pm. I had thought to do the 5.20 pm, but that would not have left me enough time to do my next tour AND eat dinner. So the 4.20 pm time slot was perfect. It was quite a nice cruise, with a guided commentary of Hong Kong Harbour’s most famous sites. These sites are almost all buildings, so an hour is just long enough to relax in the sea air, enjoy the view and learn about architecture without becoming bored. My afternoon ended with a ferry ride back to Kowloon and hopefully a nice dinner somewhere!